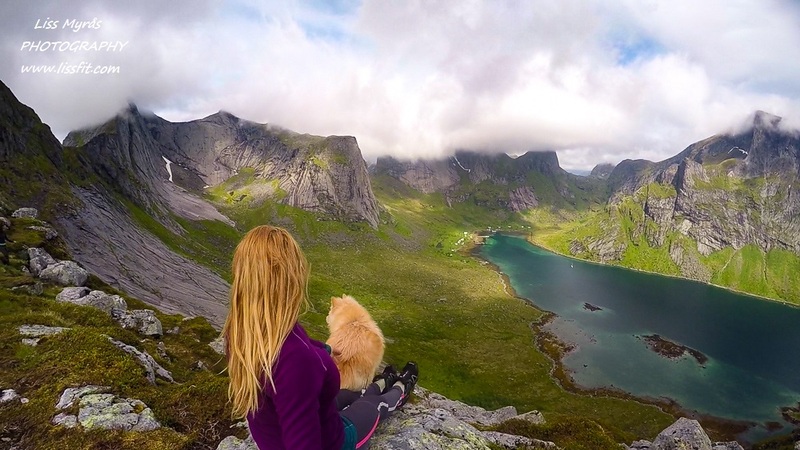 So, here I am back home in Norway again to work through the summer, but this time I choose to work in Lofoten to enjoy the magic landscape together with my puppy Jenta. 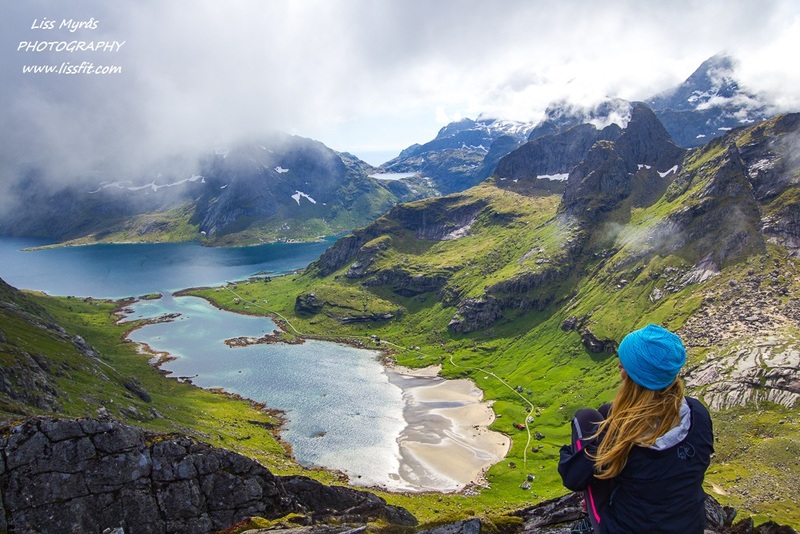 10 days biking and hiking in Lofoten two years ago only worked as a teaser for me, as there is soooo much more to see and do here …when the weather is ok alright. 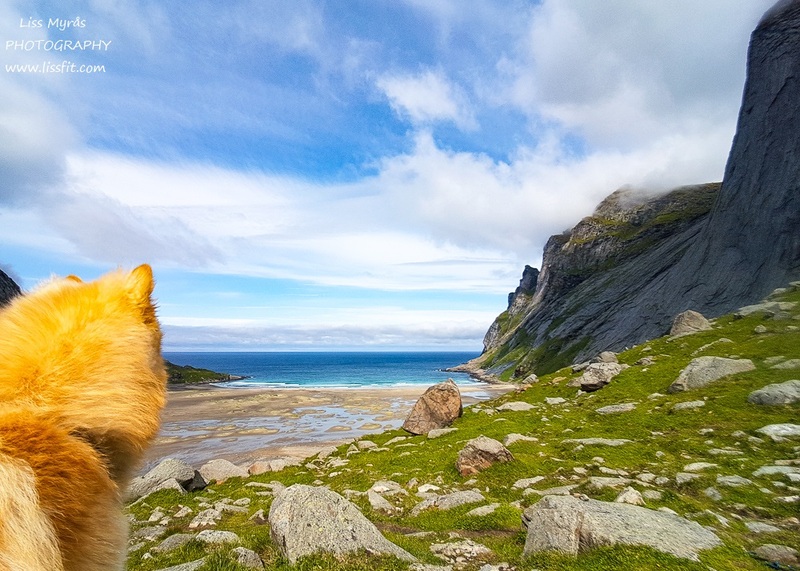 So my dear readers, we have already done several easy hikes, and last week the sun actually showed up between cloudy stormy days, and I and puppy was one of many eagerly waiting for the second extra-trip with the line boat out to the little village Vinstad from Reine. I met some wonderful people while waiting at the pier and we became a nice little group on this excursion. Hiking Helvetestinden ridge between Kirkefjord and Reinefjorden/Vinstad. 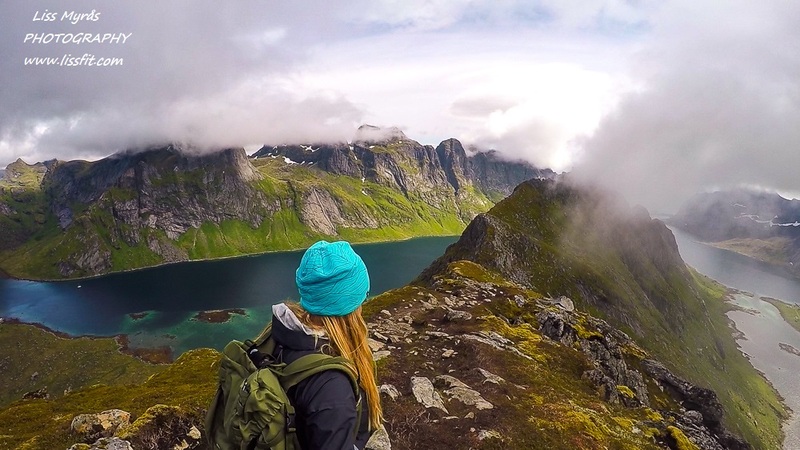 This hike reminds me quite a bit about the awesome ridge hike over Romsdalseggen a few years ago. So, after enjoying the spectacular 15 min boat trip onReinefjorden surrounded by looming mountain peaks, we disembarked the boat and hiked through a very small and cosy little village. A nice and easy trail lead us over to the beautiful Bunes beach (45-60 min) with its white sands and turquoise water. 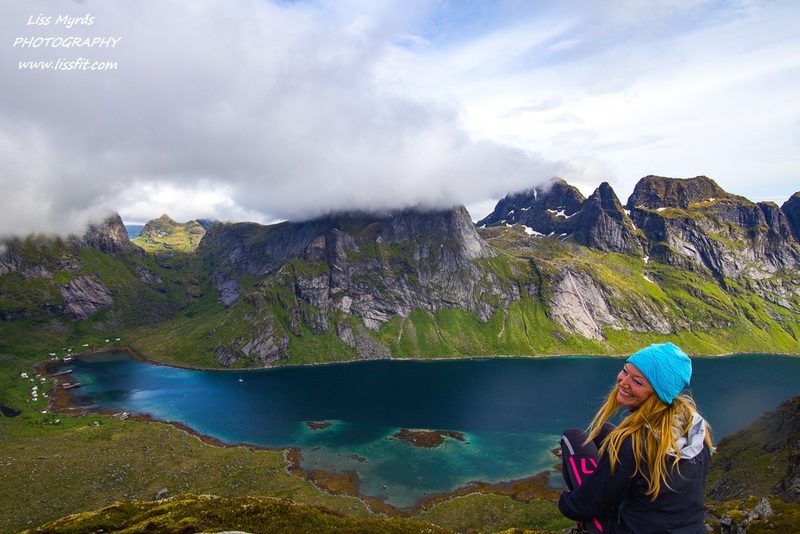 We decided to hike up to Helvetestind and see how far we would walk out on the ridge, and I can promise you we all was really thankful for that decision when we reached the mountain pass. Oh my God such stunning views! I think we all agreed that hike from Bunes beach up to the mountain pass was a relatively quick and easy hike up and not so steep, if you stick to the trails of course (someone got a bit stuck on some slippery slabs). You will have wonderful views already reaching the pass, and many are satisfied with this and have their lunch with a view there. 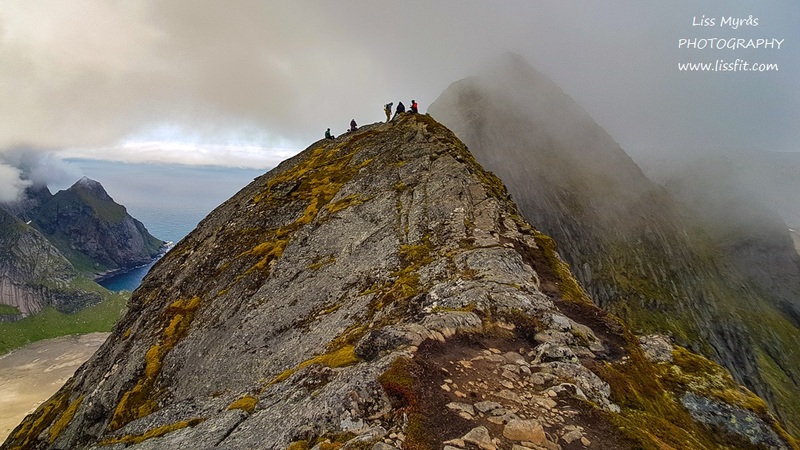 Some of us went curiously further out on the ridge (the trail actually goes in both ridge directions) to have a look, here and there it is pretty narrow, but the last peak (summit) we desisted from as the fog was already covering parts of the peaks. 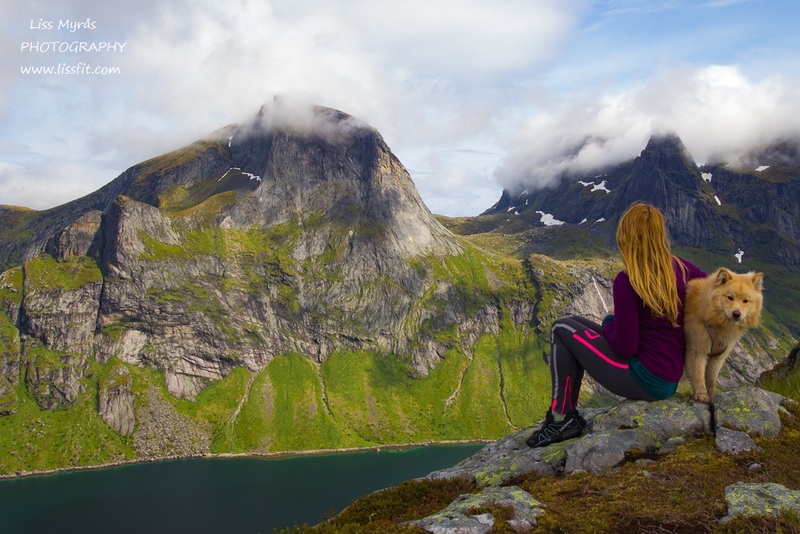 On the other side of the ridge where you hike up you will look down on Reinefjororden and Vinstad where the boat arrives – and on your way up tha trail you will probable understand what I mean by a “tiny cosy cemetery”. 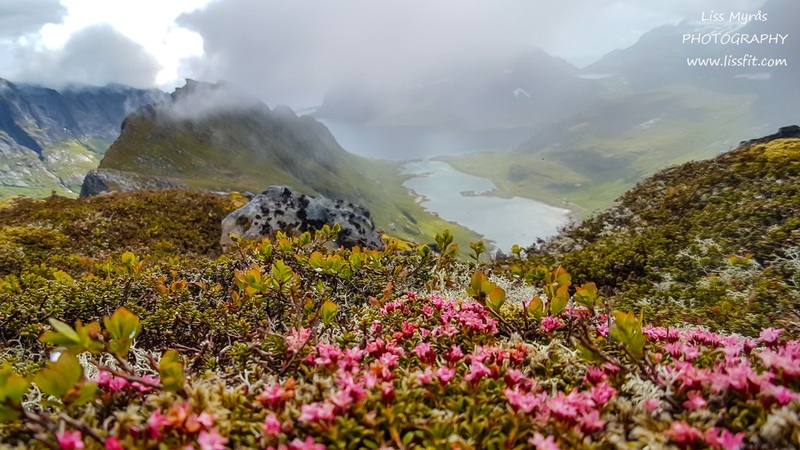 It is so easy to forget the smaller details when surrounded by such scenic views, like these small little beauties that are strong enough to survive in this tough environments: Alpine Azalea (Kalmia procumbens). Heja “Myran”, jag blir så glad, att du kör detta race, djupt imponerad, hjärtekram till dig! Välkommen till Hallstah. Hör av dig!